Place the butternut squash on a baking sheet. Drizzle with olive oil and lightly salt and pepper. Bake for 15-20 minutes, or until tender. Set aside. Place the frozen peas and pearl onions in a microwave safe bowl. Cover with plastic wrap. Microwave for 5 minutes. Meanwhile, melt 2 Tbsp. butter in a large skillet over medium-high heat add the onions, butternut squash, peas, turkey, and fresh sage. Cook until heated through; turn heat down to low. To make the sauce, mix the flour in 1/2 cup of cold water. Whisk to remove any lumps. In a medium pan, melt 2 Tbsp. butter, add the flour mixture, and chicken stock. Heat to boiling; add the 1/2 cup cream. Mix in the 2 cups (your favorite flavors) cheese. Boil and simmer for 5 minutes until slightly thickened. Salt and pepper to taste. Spray a 9×13 pan with cooking spray. Fill with the turkey mixture. Pour the sauce over the chicken mixture. Unfold the thawed puff pastry onto a lightly floured surface. Roll pastry to seal any cracks. Beat the egg and water together in a small bowl. Brush over the pastry. 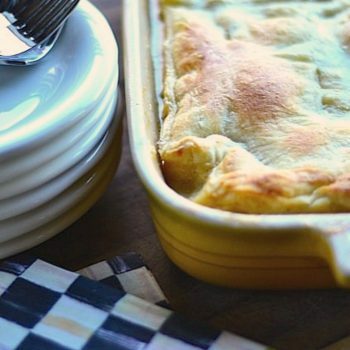 Place the prepared potpie on a baking sheet. Bake for 10 minutes. Cover the pastry loosely with aluminum foil to prevent burning and cook for an additional 25 minutes. Remove the foil and bake another 5-10 minutes, until crust is golden brown. Remove from the oven and allow the cool for at least 10 minutes before serving.